Your roving reporter is home, a safe and uneventful trip; the best kind. But on the way home I had the chance to consider a point or two I'd like to share. There was a sense of new beginning -- a new start. Talking with Apostle Linda Booth just as I was leaving yesterday she said, "Bob, I'm excited about the future possibilities. We are in a good place." So my question to us all is this - How do we, who were part of the conference experience, translate what we felt into a language and action in our home congregations that makes a difference? And how do we, in our local congregations, make the dreams and vision of Community of Christ leadership real and alive in our smaller, local communities? A thought I've read often is, "Don't tell God how big your problem is, Tell your problem how big your God is." So is your God big enough to tell someone about? Is your God powerful enough to tell you ailing friend about? Is God's compassion big enough to tell your hurting neighbor about? Is God's assurance big enough to tell your worried coworker about? Is God's love big enough to share with someone who is about to lose their home, or family? Is God's generosity big enough to volunteer at a local food bank, or mission? Is God's hope big enough to share with someone you know who may not see any hope for their future? Is God's peace big enough to share with someone you care about who is lost and afraid? Is God's joy big enough for you to share with someone who seems to have lost the joy of living? Steve Veazey is the new leader, the President of the Community of Christ. We have several new members of the Council of Twelve Apostles, and an updated Bishopric. But it's not enough. A few new leaders are not enough to change the world and build Community - Zion, in the places where you and I live. We need to join the mission. We need to see the vision. We need to answer "YES" to the call! Can we? Will we? During conference, I pledged a hearty YES to go back and make a difference at home. It's an easy promise in the midst of hundreds of others, all riding on the spiritual wave of promise and optimism we felt. But the question remains, can I keep my promise here, at home, in my local congregation and community? And can I be infectious with my desires so that others will want to come along. Can I help my congregation become healthy, in all three areas of congregational life; 1) internal activities like worship, pastoral care, education, 2) external activities like peace and justice ministries and community service, and 3) inviting and witnessing activities? Will we risk being relevant to those we are called to minister and witness to? Will we join together, as never before, to answer YES to the call? Will we live the mission to create community? 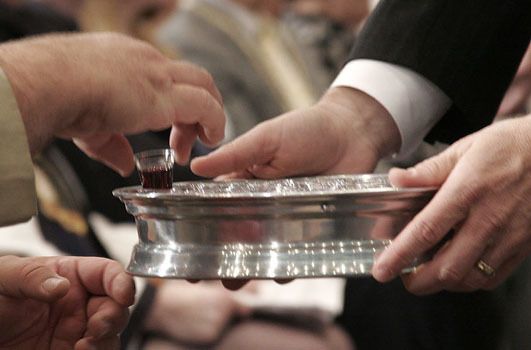 Will we invite others, as Andrew did in the New Testament, to "come and see?" And will there be anything so see if they do come? We worship a big and powerful God. We worship and awesome God. Let's go show and tell someone about our God!! Conference photo albums are here. So much happened today it's hard to know what to write about, and what to leave out. The day started early with Quorum caucus, and mass meetings starting at 7:30. We all needed to consider and vote on all the changes to Leadership Steve Veazey had proposed. In the reports from each of these groups the votes were unanimous, or at least without dissent. Then the conference voted as a whole on the letter of counsel. It passed. The one concern and disappointment seemed to be that all those chosen to fill the councils were "white Americans". Having carried the vote on the letter of counsel, ordinations were already planned to make sure the church was organized and prepared to do the business of the church. Ken Robinson will remain in the Presidency. 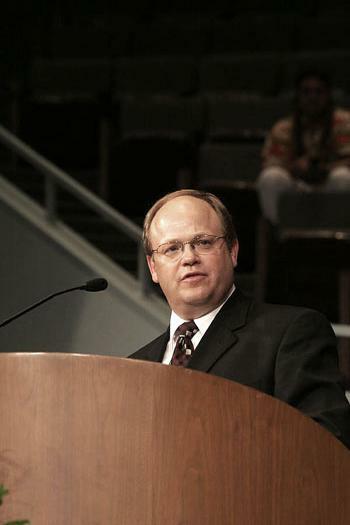 Leaving his role as Apostle and Joining Ken and Steve is Dave Schaal, called as a counselor and member of the First Presidency. 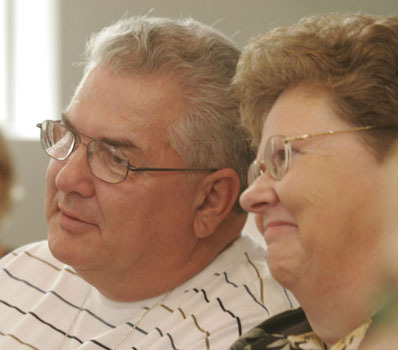 Ken McLaughlin and Gail Mengel were released from the Council of Twelve Apostles to be free to fulfill other roles as assistants to the First Presidency. 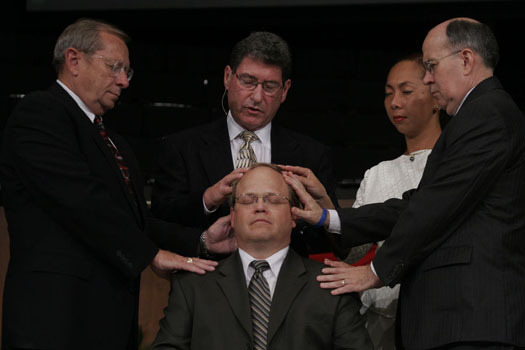 Filling the now four vacancies in the Council of Twelve Apostles are, Stassi Cramm, a former member of the Presiding Bishopric, Ron Harmon Jr., a former pastor, Rick Maupin, an adult convert to the church, and Susan Skoor, who will be the Apostle to the Rocky Mountain Mission Center. 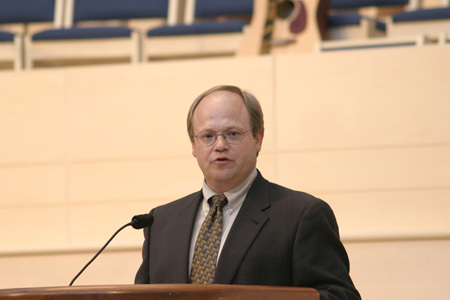 Jim Slaughter was set apart as President of the Council of Twelve. All these Ordinations took place and so the Presidency and Council of Twelve are filled and ready to go. Photos of all the ordinations are here. Filling the Vacancy in the Bishopric left by Stassi Cramm, is R. Paul Davis, who was ordained a Bishop and set apart to be a member of the Bishopric. 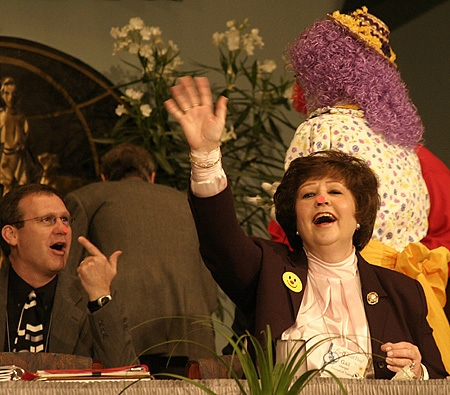 Addressing the dates for next World Conference, March 24 - 31, 2007, and extending the proposed budget one year filled out the afternoon, and the business session was adjourned. The business part of conference is over. After supper we participated in an awesome worship experience. 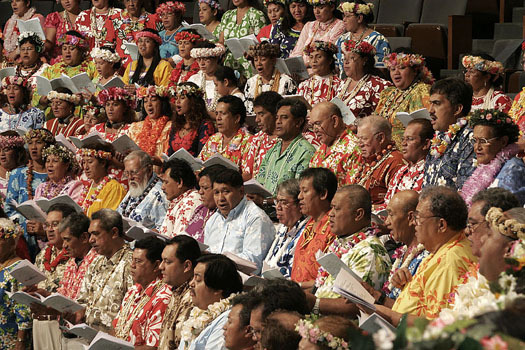 The Tahitian Choir sang, and it doesn't get much better than that. Steve Veazy preached his first sermon as President of the church, and it was powerful, challenging, and convicting. It was a outstanding worship experience. I'm sure the text of Steve's sermon will be on the World Church web site very soon. The number of attendees for this conference was significantly higher than the past few years. I think many wanted to be part of history. Overall conference was positive, upbeat, friendly, and very hopeful and forward looking. Your reporter is excited about the possibilities and potential of becoming the community we've been called to be. Each congregation needs to decide if they are going to be healthy, and alive, and be part of the future, or just exist awaiting an untimely and slow death. I choose life. And I pledge my gifts, talents, and resources, for God's use; for the building of the Peaceable Kingdom called Zion, and for committing myself to bringing the Love of God and the ministry of Jesus to those on the fringes; marginalized by society, seeking an encounter with the Divine. Will you come on board and be part of the team? Thanks for reading. 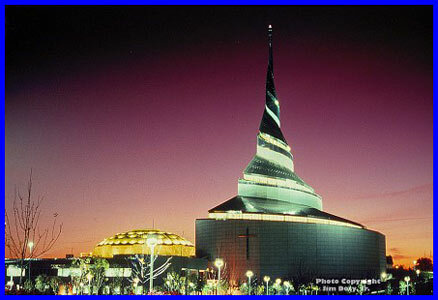 Don't forget to check out the photos on the Church's web site, and Jim's album site (click in the conference 2005 albums). The morning started out almost perfect. Cool, still, not overly humid. But very soon lightning split the sky, thunder rolled, and the sky opened up. Buckets of rain. But even that couldn't dampen the spirits of those gathered for morning worship. 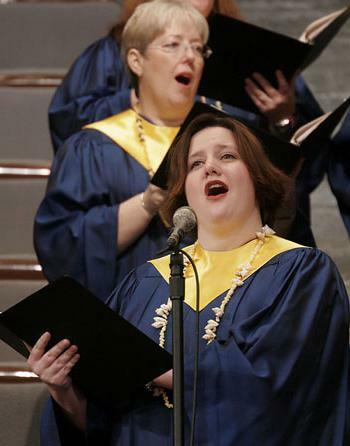 We started out with a somewhat modified hymn fest that was joyful and robust. 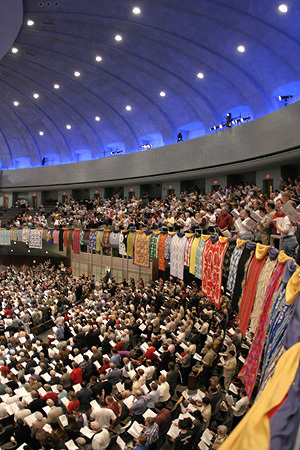 Singing with thousands of others can fill the soul in a way that bad weather can't extinguish. After worship, the document we've all already read, was officially presented by Jim Slaughter, Secretary of the Council of Twelve. The assembly was dismissed and most persons went to their respective quorum or caucus to discuss and vote on the document. In my Seventy Quorum there were many words of acceptance, anticipation, and approval. The vote was unanimous in support of Steve Veazey being set apart as the new President of the Community of Christ. After lunch we gathered in session again. Steve shared a few words and then was escorted out of the chamber while we listened to the report of each quorum, caucus, and mass meeting. Each one was a glowing endorsement for acceptance of the document and Steve as President. After all the reports were entered into the record the floor was opened to discussion and debate. Only one person spoke; I think most felt they had been heard in their respective meetings. The vote was called and there was overwhelming support to the acceptance of the document. This reporter saw only a few dissenting votes. I think there is always a few who would have another vision in mind. Several standing ovations followed and Steve was ushered back into the chamber as we sang, "We Thank The, O God, For a Prophet." It's a long standing tradition. After Supper we gathered, very early to get a good seat, for the ordination service. 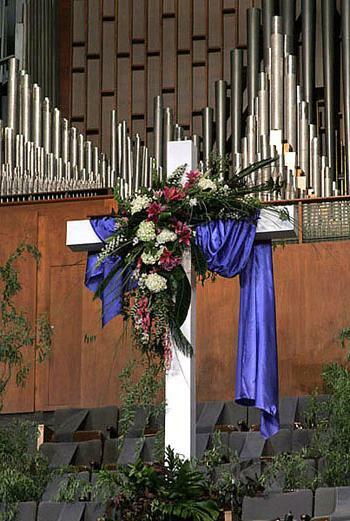 It was a rich service of reading, song and prayer. 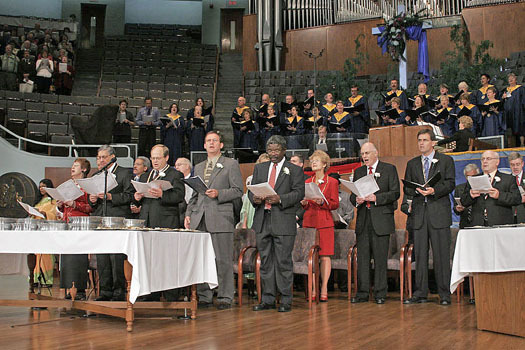 There were several who actually shared in the Ordination Prayer, each representing some part of the worldwide church. Steve shared a wonderful acceptance and charge to the church. Apparently another tradition was that several awesome art treasures representing the major areas of the church, Africa, Asia, Australia and the Islands of the Sea, Europe, North America, and South and Central America and the Caribbean. These will become a permanent part of the worshipers path in the Temple. You can view some of these art treasures (and other conference pictures) at ImageEvent.com/JimDoty. Tomorrow we will consider and vote on changes to the Leadership Council of the Church including changes to the Apostolic Quorum and the Bishopric. Tomorrow I will detail those changes. It was an historic and powerful day; a blessing to be a part of and this reporter was especially grateful to be there. May God keep us to fulfill the mission we started over 170 years ago, and through many, many changes in leadership. As Grant McMurray shared in 2004 from Section 161 of the Doctrine and Covenants, "The path will not always be easy, the choices will not always be clear, but the cause is sure, and the Spirit will bear witness to the truth....." God Bless until next time. I don't know if you're like me, but I know I am. I usually start a car journey with a full tank of gas and a clean car, or at least a clean windshield. So the first bug splat is very noticable; in fact the first few are. But after a while I hardly seem to notice the spotted and dirty windshield. Until I stop for gas, and clean the windshield. Upon re-entering the car I'm amazed at how dirty it was by contrast. My spiritual journey is similar. When it started out I seemed all new and shiney. Every bug splat was very noticeable. But after a while I seemed less disturbed by the splats. Until I have a cleansing experience, which helps me see in contrast what I can be. God is in the business of cleaning off the bug splats and giving me a new and fresh start. Conference is one of those renewing experiences with God and God's people. I love seeing more clearly again. 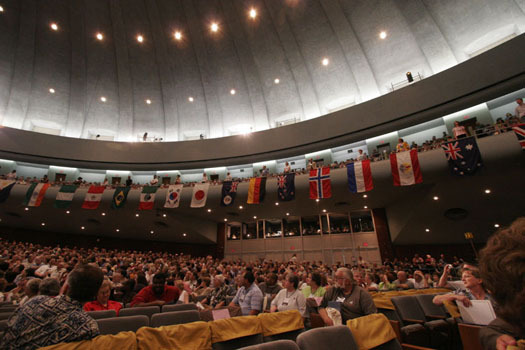 Day one of the 2005 Special World Conference is in the books. It was, as expected, a day of greetings, renewed friendships, and caching up. The rich colors and diversity of flowers is mirrored by the rich colors and diversity of the people here. God is indeed an extravagant God. 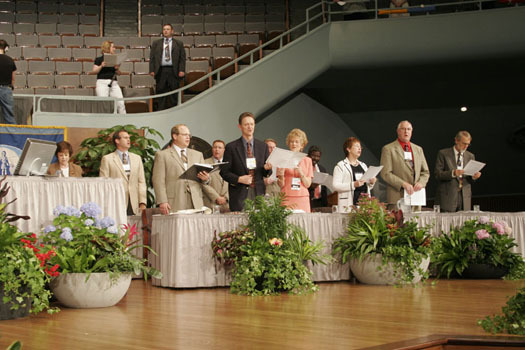 Conference attendees were again reminded of the many countries of the world where the Community of Christ either has an established church, or at least a presence. 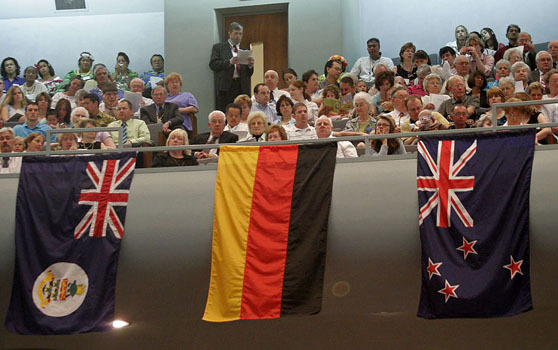 In the past the flag of each nation has been carried into the Auditorium Chamber by a person from that country, if possible, in cultural attire. 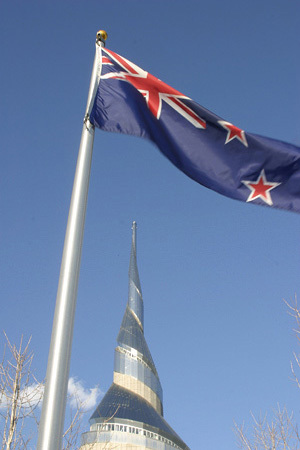 This year all the flags were coiled on the rail of the balcony, and unfurled as the name of the country was read. It was still an impressive reminder of the presence of the Community of Christ in the world. We sang, accompanied by a wonderful brass ensemble complete with tympanys, a bass drum, and cymbals. It was awesome. We were addressed by the Mayor of Independence, and also by congressman Cleaver, who received an honorary PhD from Graceland University. Tonight was mostly getting the Conference "in order" and preparing to do the business of the special conference, which is pretty much sustaining Steve Veazy and the other newly appointed leadership in the Presidency, the Quorum of Twelve, and the Bishopric. There is mixed emotion at this conference. 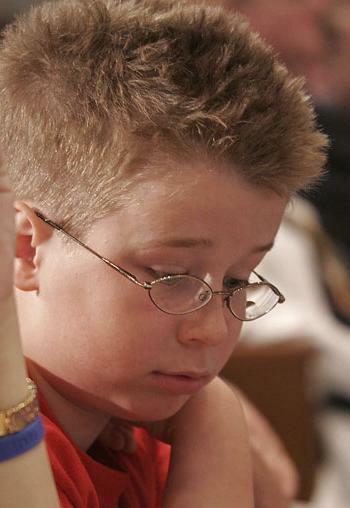 Many people feel somehow saddened by the absence of Grant McMurray in the Presider's chair. An emotional video highlighted much of the growth in the last eight years of Grant's Leadership. At the same time there is a definite aire of excitement and anticipation looking forward to Steve Veazy's and the new Council of Twelve's leadership. Tomorrow, and the remainder of the conference, promise to be a time of support, affirmation, and commitment to follow Jesus into the world. As each one offers their unique gift to the fulfillling of our mission, we complete the picture of Jesus ministering unto all. May God help us all see clearly our part in the mission to promote Christlike communities in all the places we work, play, and live. And may God give us all a renewed sense of our worth in the process. 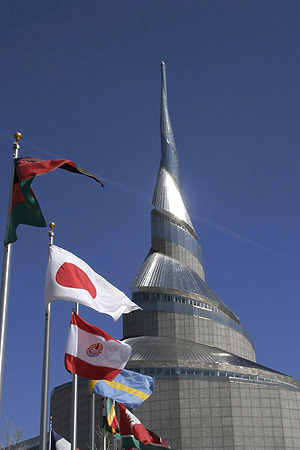 Flags of the Nations, Auditorium Rostrum. 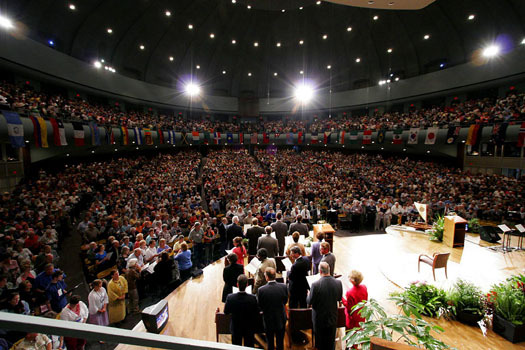 This is the first edition of the 2005 World Conference News, almost live, from Community of Christ Headquarters in Independence, MO. Today's column is actually being written from my home in Denver, as this reporter, along with several thousand others, has been busily preparing for this conference, which is earlier than expected, because of major changes in leadership that are pending for the Church. 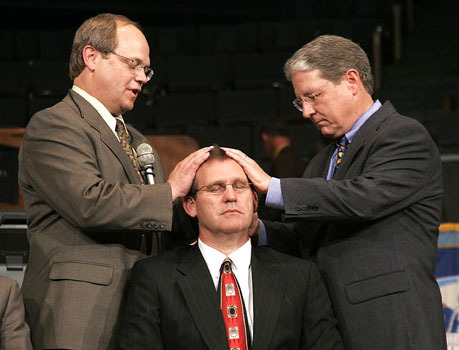 Delegates in just a couple days, will be voting on the Ordination of Apostle Steve Veazy as the new Prophet/President of the Community of Christ. Steve has already published and presented, many of the changes in leadership that will accompany his. 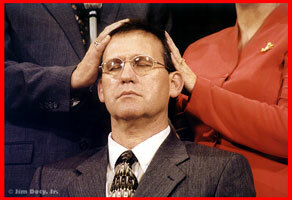 And so the Church will be in flux for a few days as new assignments for Apostolic Leadership are announced. Some of you may have already read copies of some of the proposed changes. For others, this column will keep you in the know as approval is given. Delegates, like myself, from over Fifty countries have been busily preparing for this conference, and many are already traveling toward Independence, Missouri, or have already arrived. Others, with less travel time, will be leaving anytime in the next couple days. I will leave tomorrow. This reporter can hardly wait for all the excitement that is about to happen. 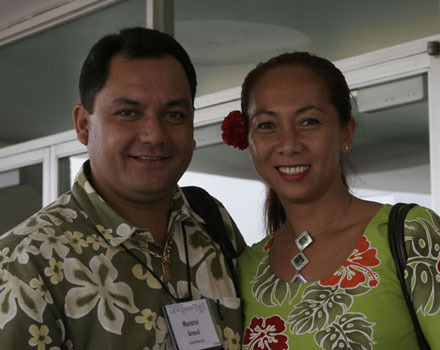 Greeting many, many old friends, often seen only a gatherings of this magnitute, greeting new friends, many made even as recently as October, when this reporter was blessed with a trip to Tahiti, and worshiped with many new friends there. There will be greeting, handshaking, cheek-kissing, and hugs. There will be singing, and worshiping, and listening and voting. There will be fellowship and food -- too much food. Early mornings and late nights will blur into one large experience. And you, faithful reader, can stay tuned right here for all the latest and greatest. As usual, one of the exciting features of this column will be the, almost live, daily photographs by one of the premier photographers in the Church, and my Brother and brother-in-law, Seventy Jim. So join us daily, right here, for updates, info, pictures, and editorial comments by your faithful conference/SPEC reporter. As mentioned, I leave tomorrow, for about ten hours of travel, and Conference will begin Thursday afternoon. Until then, keep us all in your prayers, the travelers, the delegates, the leadership. At this historic time we need to be unified in our purpose and mission, to Proclaim Jesus Christ, and Promote Communities of Joy, Hope, Love, and Peace. May God Bless you as you support and affirm the changes and direction of ministry these new leaders will be calling us to go. Until next time, this is your roving reporter, signing off. 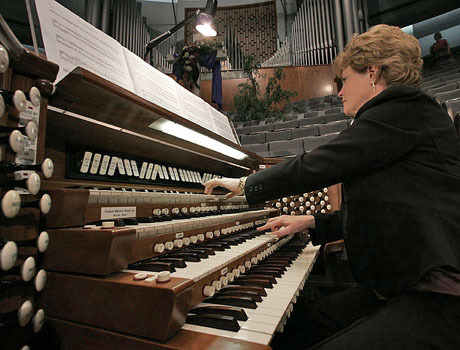 Since the announcement of my call, I have been preparing for the responsibilities inherent in the role of prophet-president of the church, should the World Conference approve my ordination. One of the most pressing considerations has been how to best align the gifts and callings of individuals with the leadership needs of the church. As I have listened carefully to the perspectives and desires of World Church leaders and prayed regularly for guidance, God has graciously blessed me with a growing sense of direction applicable to this transitional time. In response, I am presenting this letter of counsel pertaining to the presiding quorums of the church. I do so with a deep sense of humility and faith, trusting in the One who is always seeking to guide the church. If I am approved by the World Conference, I intend to formally submit this letter to the councils, quorums, and orders, to the World Conference, and to the church following my ordination. 1. 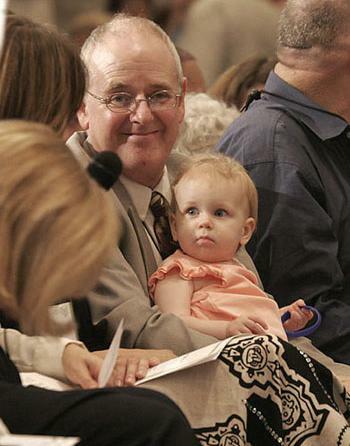 Peter A. Judd, who has served as a World Church minister for thirty-four years, including four years in the Council of Twelve and five years in the First Presidency, is now afforded the honor of retirement from World Church appointment and from the Presidency, as requested by him. His purity of heart, creativity, pastoral spirit, keen mind, and broad range of ministerial gifts have been a blessing to the church throughout the years of his service. The stability and experience he brought in the Presidency during the months following the unexpected resignation of the president of the church have been valuable beyond measure. Likewise, his contributions of writing, worship leadership, resource development, and skillful management throughout his ministerial career will continue to benefit the church into the future. Relieved of the heavy burden of presidential responsibility, he will be free to serve as a high priest and to pursue his continuing interest in various aspects of church life and mission, including ministry with his companion, Kris. 2. 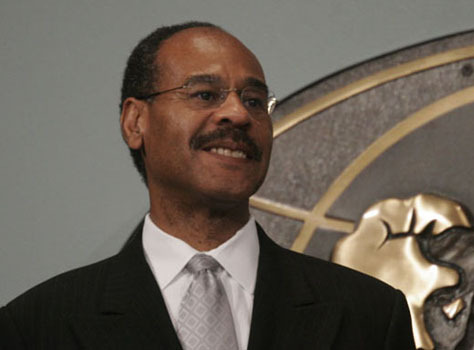 Kenneth N. Robinson is called to serve as a member of the First Presidency and as a counselor to the president of the church. His spiritual insight, experience, and wisdom arising from many years of ministry as a World Church officer, including nine years in the First Presidency, will be a strength and a blessing in the Presidency during this time of transition and alignment for the future. His responsibilities in the Presidency should be arranged so as to allow him to concentrate his efforts on helping the church understand and pursue its worldwide mission. 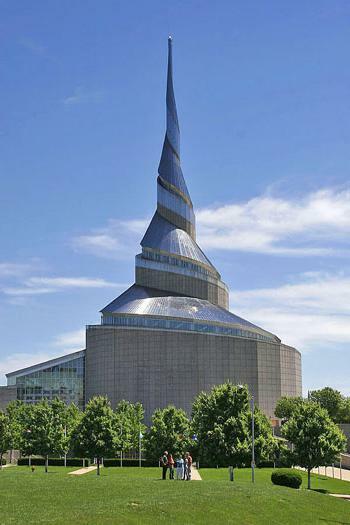 Particular emphasis should be brought to the call to more fully express the vital relationship between the ministries of the Temple as a vibrant ensign of peace and the essential meaning of the Restoration as healing and redeeming agent in all of the nations and cultures where the church is established. 3. David D. Schaal is called to extend and express his apostleship in service as a member of the First Presidency and as a counselor to the president of the church. His deep devotion to Jesus Christ, his extensive ministerial gifts, and his wide range of experience in pastoral, missionary, and presiding roles in the church will serve him well in this new responsibility. As an advocate for ministry with children, youth, and young adults, he will be a vital asset in the Presidency as attention is given to developing World Church and congregational ministries that will shape the future of the church. His evident sensitivity to the Holy Spirit, and his ability to clearly communicate gospel truths to all generations, will be further magnified as he accepts this call. 4. Kenneth L. McLaughlin, who has served as an apostle for eleven years, is honorably released from the Council of Twelve, in harmony with his desires, to free him to serve as a high priest and to accept assignments from the First Presidency. In light of his particular gifts and interests, these assignments will be focused on ministerial education and processes related to the development of vital resources and services to support the church’s worldwide mission. In order to maximize his continuing contribution to the church, he will be provided the opportunity to pursue additional theological education, with an emphasis on church mission. 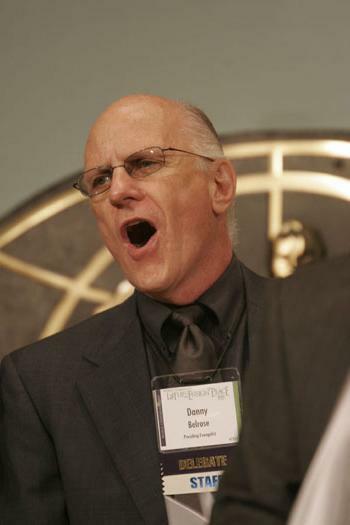 Ken is also encouraged to continue to express his gifts of hymn writing and designing worship experiences that will draw people into transformative encounters with God and that will help them better understand the identity and mission of the Community of Christ today. 5. 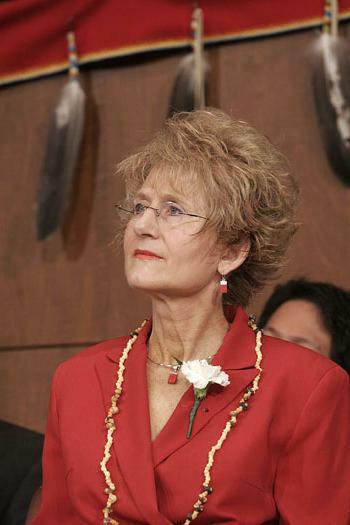 Gail E. Mengel, who has served as an apostle for seven years, is honorably released from the Council of Twelve to allow her to serve as a high priest and to accept ministerial assignments from the First Presidency. Gail’s gifts of tenderness, sensitivity to the Spirit, vibrant witness, and compassion for all of God’s children will continue to be a blessing to all who receive her ministry throughout the world. In response to current opportunities and needs, Gail will also serve as the Ecumenical and Interfaith Officer of the church. 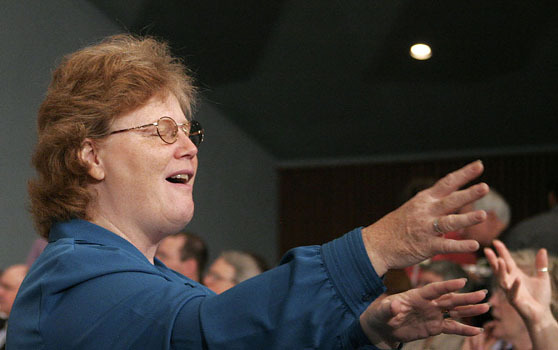 In this role, she will be able to devote her energies to her responsibilities as national (U.S.A.) president of Church Women United and especially to supporting the First Presidency as it engages the church in various faith and community organizations where the church is called to express its witness of Zion, the peaceable kingdom. 6. Stassi D. Cramm is called from her role as a counselor to the presiding bishop and member of the Presiding Bishopric to serve as an apostle and as a member of the Council of Twelve. Her training and experience in strategic planning and organizational design, coupled with her enthusiasm for relevant church ministry, will stand her in good stead as she accepts and integrates this emerging dimension of calling into her life. 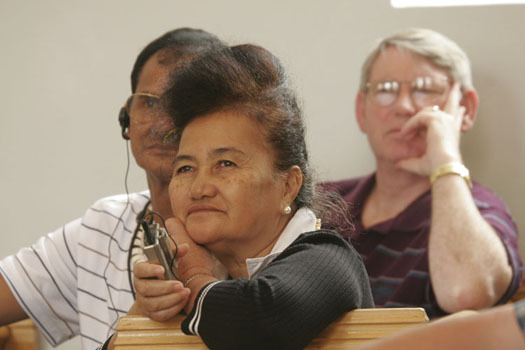 She is called to help the church focus its priorities, procedures, and resources so that it can more effectively pursue its mission of sharing the liberating truths of the gospel and promoting communities of peace throughout the world. She is particularly called, as an apostle, to bear enthusiastic and creative witness of the living Christ, the source and center of our faith. 7. Ronald D. Harmon Jr. is called from his current assignment to serve as an apostle and as a member of the Council of Twelve. Ron’s experience as a pastor and his dedication to the renewal of congregational vision and mission will be a blessing in the areas where he will serve. In addition, his leadership development training and experience will enable him to make a vital contribution to the church as it seeks to expand its base of capable leaders, pastors, and priesthood. He may accept this call to be an especial witness of Jesus Christ with the assurance that his place in the Council of Twelve is timely, and that his ministry will truly make a difference in the forward movement of the great and marvelous work of the Restoration, which is his heritage and passion. 8. 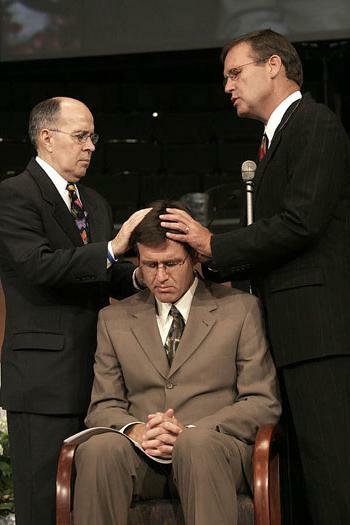 Rick W. Maupin is called from his current assignment to serve as an apostle and as a member of the Council of Twelve. Rick’s faith journey, which has brought him to membership, ministry, and leadership in the church, provides the foundation for a dynamic witness of response to God’s call, which sometimes comes in unexpected ways. As one who is truly willing to bear the burdens of others, he will continue to be the means through which many will come to a greater experience of the love and purposes of God as revealed in Jesus Christ. While maintaining his sincere attitude of humility and equal regard for others, he should apply himself fully to the call to be an apostle. 9. 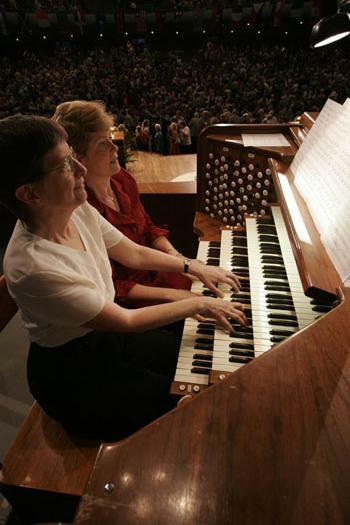 Susan D. Skoor is called from her current assignment to serve as an apostle and as a member of the Council of Twelve. 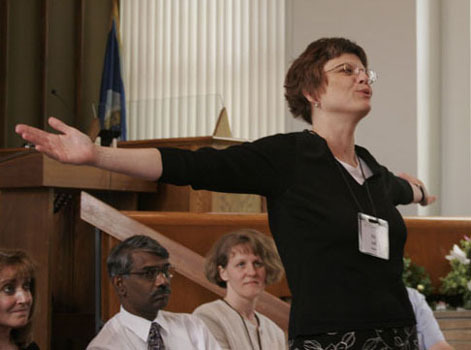 Susan’s unwavering willingness to respond as a servant minister according to the needs of the church is a testament to her devotion to Christ. Her broad experience in congregational and jurisdictional leadership will be a blessing to the church wherever she provides apostolic leadership. Susan has unusual insight into the ways of Jesus Christ, the compassionate healer and peacemaker. This aspect of her ministry will continue to blossom as she responds to the call to be an apostle who bears the message of peace and salvation to all who will hear. 10. R. Paul Davis is called to the office of bishop and to serve as a counselor to the presiding bishop of the church as a member of the Presiding Bishopric. Paul has been prepared for this role through education, employment in the world of business, and field ministry as a mission center president and financial officer. As a result, he has a comprehensive understanding of various dimensions of church life, administration, finance, and leadership. Paul will bring a vital contribution of creative insight, skill, and energy in this new avenue of service during a time when the Presiding Bishopric is being called upon, along with other World Church leaders, to engender greater response among our members to the principles of stewardship and generosity to support our mission. 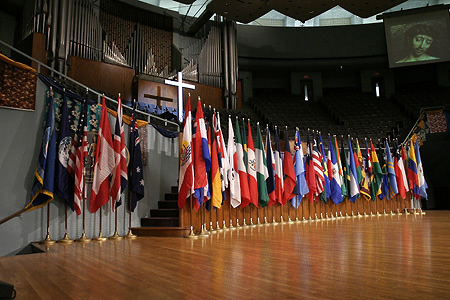 In addition to the specific counsel offered above, I want to express my deep appreciation for all those who currently serve as World Church officers and ministers. It is my hope and prayer that in the days ahead you will sense with increased clarity your calls to ministry, understanding that it is a sacred privilege to serve God’s children as representatives of Jesus Christ and the Community of Christ in the world today. Continue to magnify your ministry through prayer, study, and unreserved service and you will be blessed with renewed vision, passion, and enthusiasm. Be fully present with our members and others as witnesses of the promises, blessings, and peace of the gospel of Jesus Christ. Even now, I am aware of persons serving as World Church ministers, and in other vocational and educational settings, who are being prepared to accept additional callings and responsibilities in the years ahead as the needs and opportunities before the church shall require. 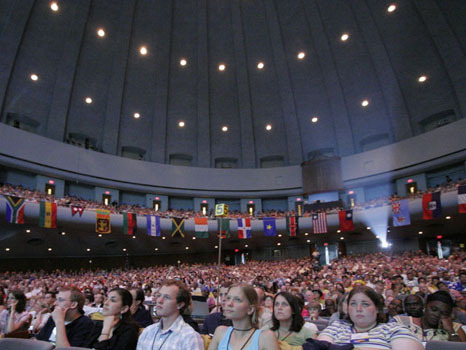 World Conference of the Community of Christ is June 2-5, 2005 in Independence, Missouri. Reports by Seventy Bob will appear here during conference, along with photos by Seventy Jim. Conference photos will also begin appearing at this album site. 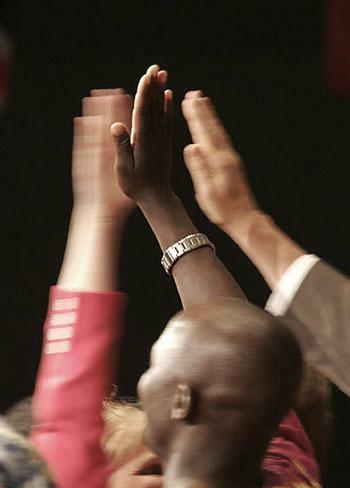 If you scroll down the page (going back in time), you can see albums from the last conference in March-April 2004.